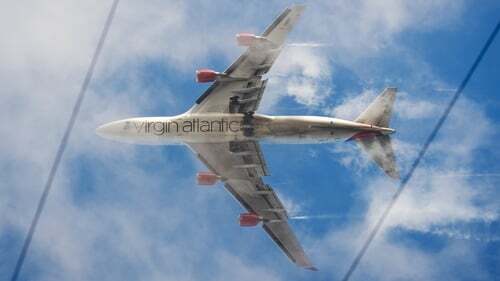 Virgin Atlantic has posted an annual pre-tax loss for the second consecutive year, hit by a shaky economy, the higher costs of fuel generated by weaker sterling and problems with Rolls Royce's Trent engines. The airline is the 1980s brainchild of British billionaire Richard Branson. It fell back into the red in 2017 after three years of profits, as competition intensified and the weakening of the pound added to already rising fuel costs. Best known in Europe for the trans-Atlantic planes it flies with Air France-KLM and Delta, Virgin said its loss before tax and exceptional items was £26.1m for the year ended December 31. This compared to a loss of £49m in 2017. Total revenue rose 5.8% to £2.78 billion, as passenger numbers grew just under 5% to 5.4 million and revenue per customer rose 1.7%. The company said its performance had suffered from economic uncertainty and the weaker pound - which increases costs because fuel is priced in dollars. It was also hit by the well-documented problems of the Trent 1000 engines used on its Boeing 787 jets. "While a loss is disappointing, our performance has improved in 2018 despite challenging economic conditions and put us on a trajectory for growth and return to profitability," chief executive Shai Weiss said. Rolls-Royce today agreed to an early inspection of some Trent 1000 TEN engines by regulatory authorities, a week after Singapore Airlines grounded two Boeing 787-10 jets fitted with the units. Aer Lingus owner IAG in February chose Boeing 777-9s, rather than a competing package from Airbus in part powered by Rolls, underlining the risks to airlines from the engine issues. Since then the industry has been thrown into chaos by the grounding of Boeing's new 737 MAX planes after a second fatal crash within six months. The pound fell 5.6%against the US dollar last year as Britain contended with the political and economic uncertainty generated by its negotiations on leaving the European Union. The airline's finance chief Tom Mackay said that while economic factors would continue to challenge the carrier in the year ahead, Virgin Atlantic was in a strong cash position. The results are the company's first since its acquisition of troubled regional airline Flybe for $2.8m earlier this year, in a joint bid with Stobart Group and Cyrus Capital.